I’ve done some good work over the past few months but I’ve been too lazy or something to produce a report. My mood is picking up now, since meeting with my doc and getting the thyroid replacement dose increased. Tellingly, much of the work I have done recently (last few months) has been prompted by a workshop. So thyroid correction notwithstanding, I worry about my low degree of self-motivation. There’s this nagging thought in the back of my mind, that age is taking its inevitable toll, and I’m not going to be able to reverse it. Not at all what I had planned for my golden years. The work that I have produced has mostly been fast draws–2-3 hour pet portraits and plain air landscapes. But one is a two-afternoon Figure in the Garden, a 20×16 masterpiece. 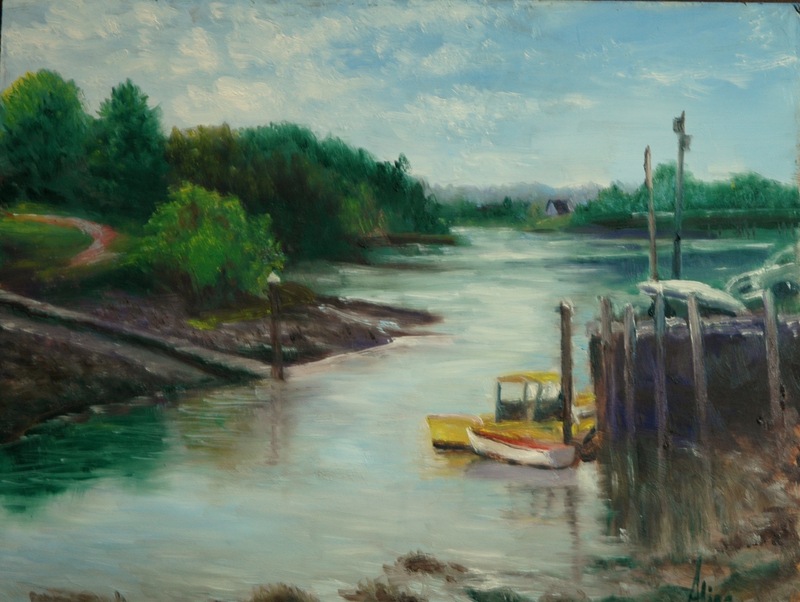 Another is a studio landscape from a Cape Cod photograph that I started last fall and left untouched on my easel all winter. I will start with studio landscape that I can now claim “took me months to complete”. It’s the coast guard station at Race Point. I had painted a small version of the building en plein air, but I also took a photo of it that dramatized the late-afternoon clouds and sunlight. I used a 18×24 canvas, making this one of the largest landscapes I’ve ever wanted to paint. The inspiration came not from the building but from the sky. I felt totally in sync with Constable, who obsessed over his clouds. Looking it over now, I think I wanted* to make the building even smaller in relation to the sky. Perhaps I will have to do a third version. *Why didn’t I? The painting took over control. The other landscape that I am pleased to show you was my first plein air effort since last Fall. 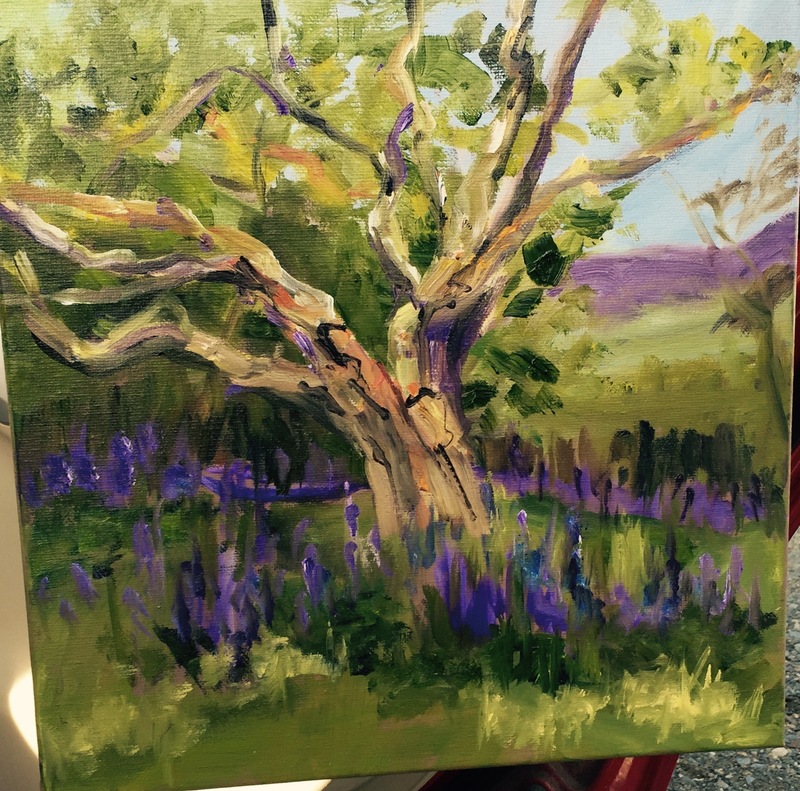 Our NH Plein Air group were invited to the grounds of Bedrock Gardens in Lee, NH. : Acres and acres of plantings of shrubs, trees and flowers; sculptures interpersed. With all that drama available, I chose to paint a field that was virtually featureless–just to get at the red roof in the distance. Sorry about the blue tape. I still have not mounted the painting onto a panel. My next foray into paint was a 2-day workshop at the NH Institute of Art with a new, young instructor named Katie Swenson. Her specialty is animals and maybe that’s my specialty too. I actually didn’t believe anyone could teach me anything new about painting animals, but I knew that was a pretty arrogant assumption and one likely to be proved wrong. Whatever, I love to paint animals and this was sure to lift me out of my funk. Well, turns out that Katie is fabulous and the other students were like-minded and I hope those connections will bear fruit in the future. (She has a Facebook page but not a website–I don’t know how to link to FB.) As for the two days of the workshop, I started with Rocky, a dog belonging to my friend Jackie, and then I portrayed Freckles (my cat who was gone for seven years) in a pensive mood. I’m going to save my Figure in the Garden for next week, when I should have another of the same kind ready to show. I don’t want to overload your senses. Hope you love the cat. Feel his woolly coat. Meanwhile, I have been pulling back from marketplaces. I closed my display at the NH Antiques Co-op. 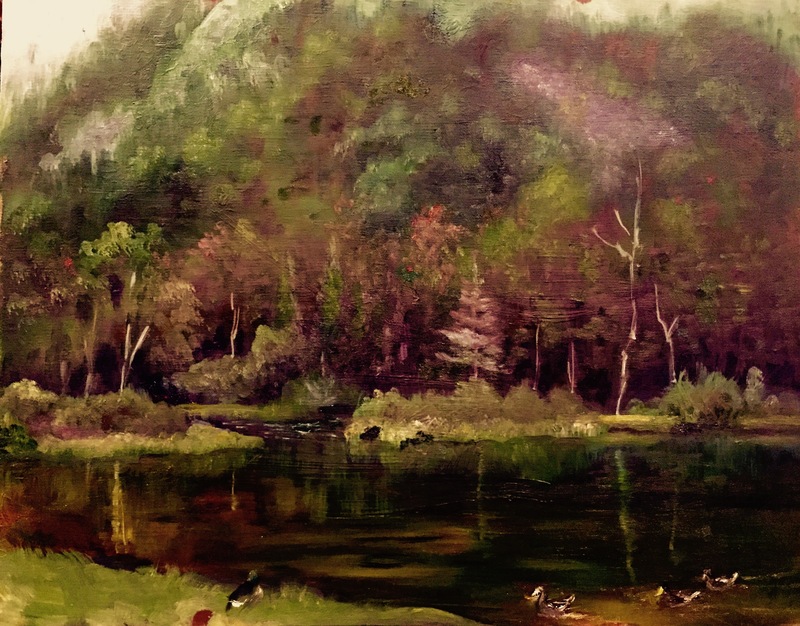 I have been showing paintings here and there (Armory in Somerville MA, Currier Museum in Manchester, Massabesic Audubon Center, Wolfeboro Library, Pease Library in Plymouth) through all the seasons, but there is nothing major going on. As usual, you may view paintings with prices and order prints, phone cases, pillows and the like at my Fine Art America pages, which are, like this blog, way overdue for updating. If the painting you are interested in is not there, or if you prefer to bypass that experience, you may contact me by email to alotter@mac.com. If you want to add a public comment to this blog, go to the bottom of this page where it says “Leave a Reply”, and enter your comment in that box. I love to get public comments, so don’t be shy! 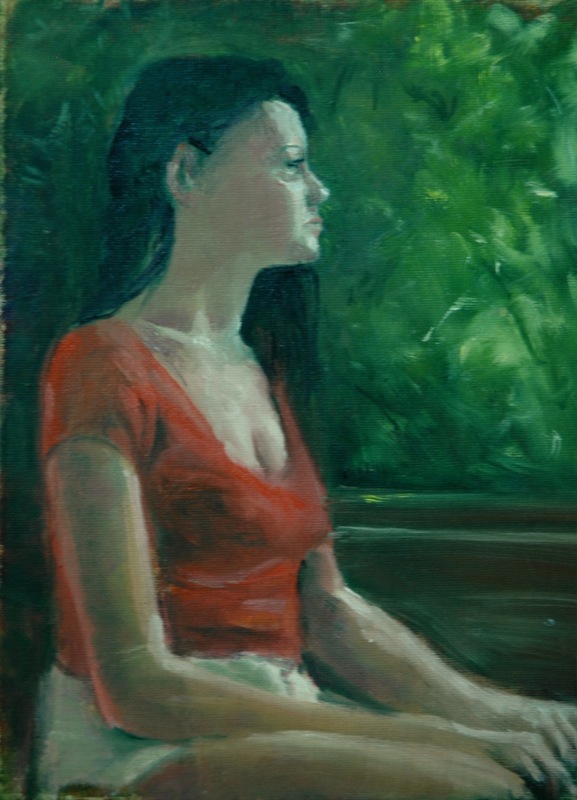 For a third Summer in a row, I participated in the David Curtis offer of a model in his garden garnished with the light touches of his guidance and that of my fellow artists. This year, we had July Sundays in addition to the August Sundays, plus an errant June Sunday to get us in the proper mindset. We got rained out only once, giving me a total of eight Sundays, eight figures, eight paintings. 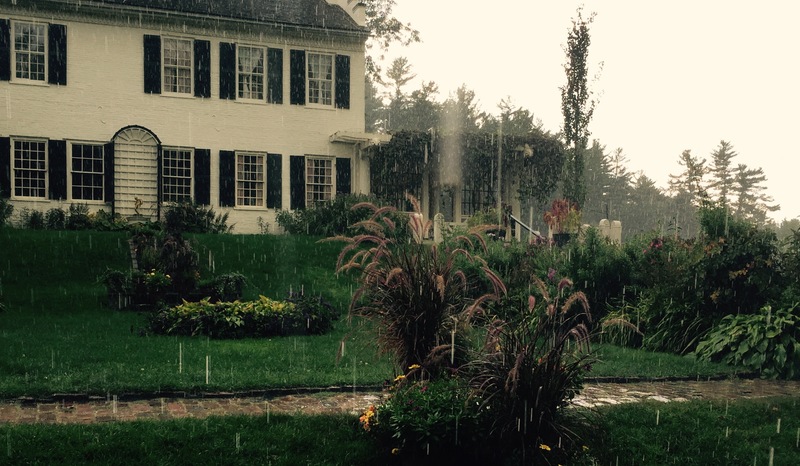 David’s home and garden is in Gloucester, an hour and a quarter drive from my home. This year I had company on the trip. I persuaded Cynthia Arieta to try it out; she prefers figurative painting too, and we met during Cameron Bennett’s Cornwall workshop a few summers ago. She’s now as hooked as I am. For models, we started with David’s wife Judy, dressed up as a Guitar-playing Gypsy. This was the June Sunday. The Rhododendrons were no longer in bloom, but David suggested I add blooms to the painting anyway, so of course, I did. The order in which I painted the middle ones might not be accurate, but who cares about that, right? I believe the second one was the Basketful of Flowers, featuring artist Marianne as our model. For both of these first two paintings I used a 20×16 Raymar panel. In the previous two summers, I had painted smaller, on 12×16 panels. I had been easily able to complete those 12×16 paintings in the three hours allotted, so this year I thought I would challenge myself by going bigger. As a result, the background of Basketful of Flowers was unfinished when I left that Sunday. I worked on it at home and brought it back the next week for comments from the others. Not particularly happy with my first two paintings, I concluded that 20×16 was perhaps too large for me to complete in three hours, and I switched back to 12×16 for number three. I call this one Diamond Bracelet. My titles are mostly hooks to remind me which painting I am talking about. 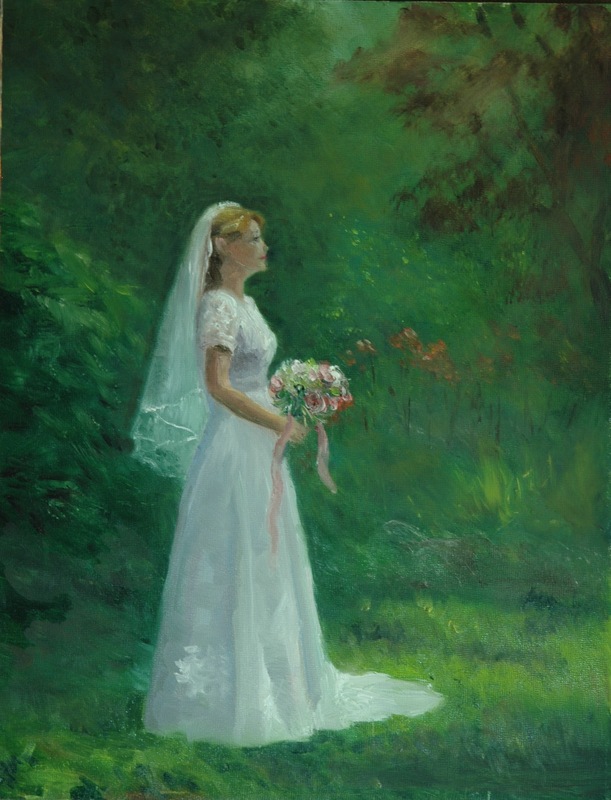 I could not use the dress color to identify this painting because, as you will see, another blue-green dress is coming up. David objected to the downsizing idea: As long as I was getting enough information on the larger canvas to finish at home, I should keep working in the 20×16 format. Subsequently I also took pains to prepare the panels that I used with a dark ground. Dark brown or rusty red were my usual choices for the ground color. Without the pressure to cover up white grounds, I could get closer to completion each Sunday. If I remember correctly, the ground for White Wicker Settee (number four) was close to black. Our model, another artist, for White Wicker furnished the settee herself and of course chose her costume. David declares repeatedly, “Artists make the best models”, and surely their choices of accessories is a big component in their success. He tried to recruit me to model next year, but I am reluctant to sacrifice my painting time. Number five. The next model is the daughter of one of us artists. I had to fake the rhododendrons again. From Gloucester to Manchester, we have been suffering from an extreme drought, and Judy Curtis, who is in charge of the garden, stands on principle in refusing to water her garden–ever. So the rhododendron blooms would not be the only flowers we had to invent or exaggerate as the drought worsened over the summer. Tablecloth and vase is the one of the eight that I am least satisfied with. After the fact, I decided I should have filled the canvas with the figure instead of letting “figure in the landscape” govern my composition choices. For future sessions, I resolved to get closer to the model and even, gasp, allow body parts to get cut off by the edge of the panel if necessary. Meanwhile, David encouraged me to paint in the pattern on the tablecloth in order to create something interesting going on. One of the most common praises he heaps upon me is that I “tell a story”. I don’t really understand what he is talking about, but hope I can keep on doing it. The next two paintings did not require me to cut off any limbs, but I did allow major accessories to get cut off. The first, George Martin, Painting (number six), started on a blackish ground. Notice how his easel slides out of frame on the right? The part I had the most trouble with was his eyeglasses. The lenses caught quite a glare from the bright sun and sky above, but when I painted them like I saw them, it was too startling and distracting. John Brown is a regular on Sundays and has posed in the past on Sundays when I could not be there. I had envied the results I had seen, so was looking forward to his portrayal of Farmer John (number seven). (Or should it be Gardener John? Doesn’t have the right ring.) I believe I can detect a red ground for this one. His wheelbarrow leaves the frame on the right. This painting was my favorite (and David’s favorite) up to that point, but there was one more week to go. Could I top Farmer John? 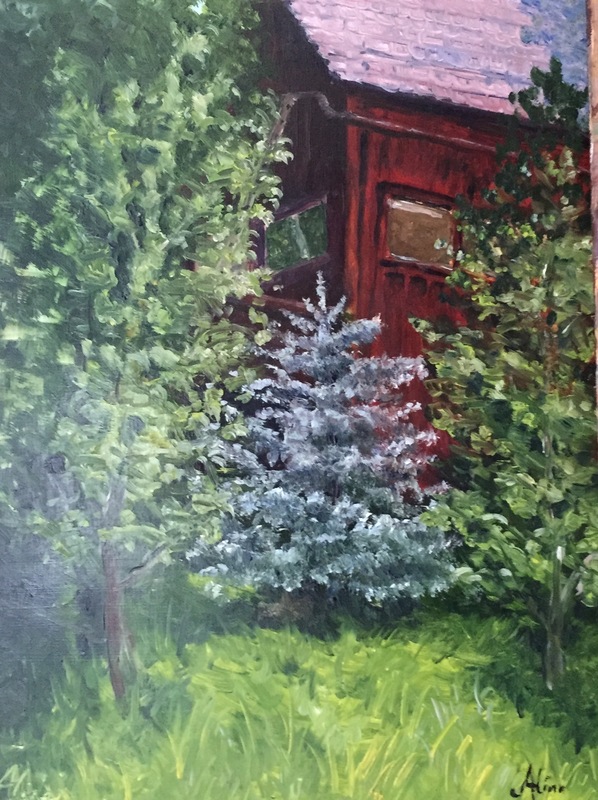 In this number eight, the last painting of the summer, the red adirondack chair makes its third appearance over the last two summers. The model is engaged to marry David and Judy’s son. Her names escapes me right now–so sorry. 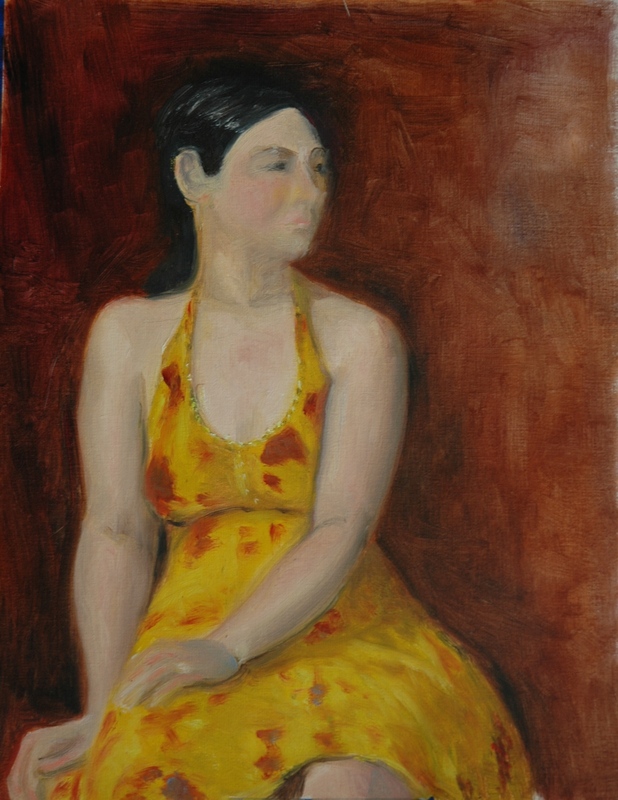 But she also modeled for us last summer in a navy blue dress holding a red parasol–my least favorite painting from any of the summers. So when she appeared again in navy blue, my heart sank. I prepared myself for a disaster of a painting. But surprise, Navy Blue with Red and White proved to be a winning combination! And to celebrate, I cut off her feet! A major contribution to the success of this painting is the shadow pattern on the parasol. The sun and the tree gave me what I needed to tell that story, whereas the shadow pattern in Diamond Bracelet was, well, no pattern at all. I may have to go back and fix that. Reminder for folks in the Chesapeake Bay area, if any there are: see two of my animal portraits at the Annmarie Sculpture Gardern and Art Center in Solomons, Maryland. Opening reception will be October 7, which I cannot attend. Alas. Maybe I will make it down there before the exhibit ends in late January. The exhibit’s theme is “Fur, Feathers, and Fins–Our Faithful Pets”. It will run from October 7 through January 29. As usual, you may view paintings with prices and order prints, phone cases, pillows and the like at my Fine Art America page. If the painting you are interested in is not there, or if you prefer to bypass that experience, you may contact me by email to alotter@mac.com. This bouquet of Sunflowers and small blue companions was a gift from another artist (thanks, again, Flo) for whom I was doing a small favor. I started the painting the same day that I received them, when the flowers were fresh, but it took me a few weeks to finish i; the flowers had all died in the meantime. So this painting is from both life and from memory. My tea mug just happened to be there when I started, and it filled a compositional need, so it got to stay. The blue of the companion flowers is picked up in the cat’s eyes on the mug. No, I sure don’t know the name of the companion blue flowers. 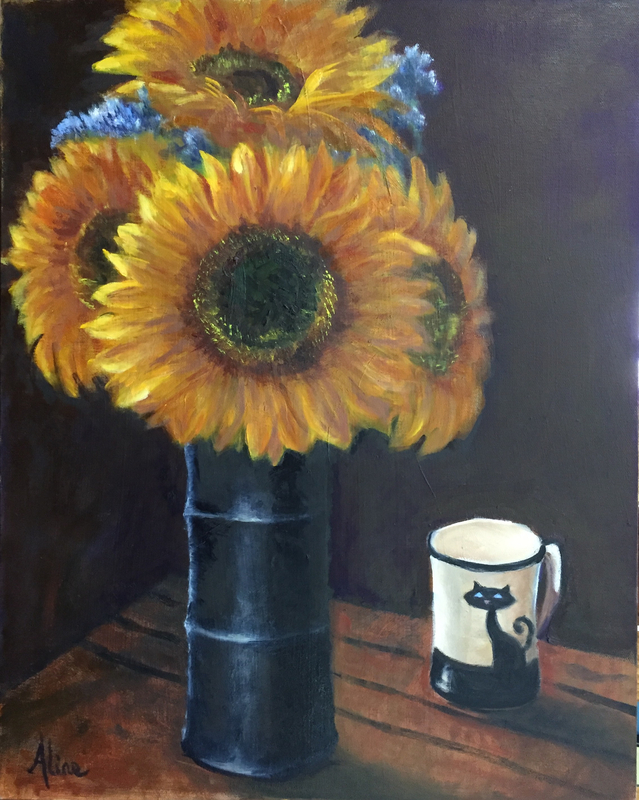 What is it about sunflowers that makes an artist want to paint them? Their sunny color, their sunny symbolism, their over-the-top size are all hard to resist, but I was also drawn to the complexity and variety of the brownish, greenish centers of the flowers. Until I had a bunch of them in my hands and could examine them close up, I never realized that the centers were variable in color and have quite a lot going on, design-wise. My sunflowers were mostly dark brown in the center, but on the periphery of the center, little green and yellow shoots were pushing through the brown matrix. Gosh, I really need to find out what all that stuff is, and what it is called. Excuse me, I’m off to Wikipedia to learn. OK, I’m back, more confused than ever. But I gleaned that the yellow petals are called the ray florets and are not really the flower of the thing. The flowers are the tiny rosettes that grow from the brown matrix. Wikipedia kindly provided this picture isolating the flowers from the (dead) ray florets. 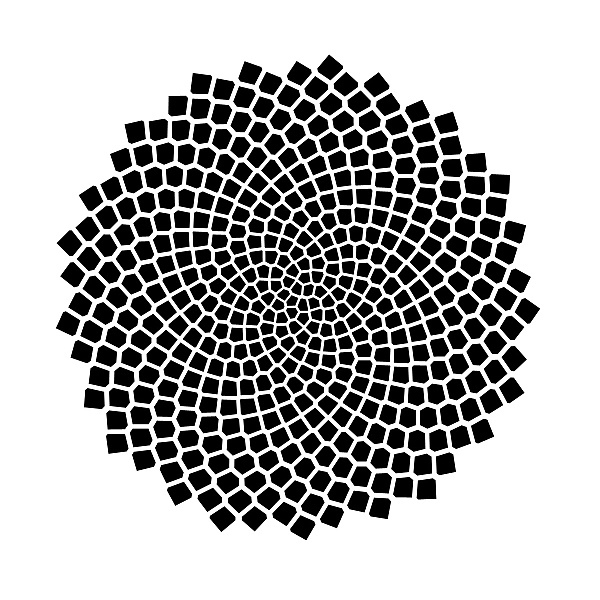 I don’t really understand how those two math concepts produce the sunflower design, and I’m so glad I don’t have to understand it as it was beginning to make my head hurt. Here’s a website on the subject that you might enjoy. Or not. My Sunflower Bouquet is for sale. It is painted on a 20×16 stretched canvas and I am asking $925 for it, unframed. At the Bartlett Inn in Bartlett; at the Bernerhof Inn in Glen; at the Red Jacket Inn in North Conway; and at the law offices of Mesmer and Deleault at 41 Brook St in Manchester. 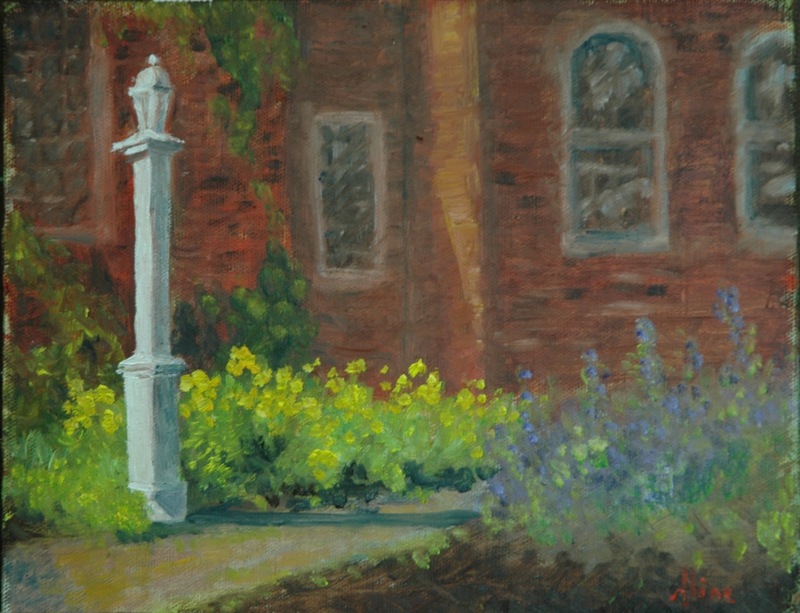 For the month of October I have two paintings in the Womens Club of Concord, part of a three-part 20th anniversary exhibit by the Womens Caucus for Art. However, the hours during which the WCC is accessible to the public are unpredictable. You can visit another of the 20th Anniversary exhibits at the Kimball Jenkins carriage house through the month of November. Opening this week, with a reception Friday night, 5-7, is the 2015 Regional Juried Show of the Center for the Arts in the New London Inn. Also on Friday night, 7-9, is the reception for the Womens Caucus for Art annual 6×6 exhibit at Apotheca, in Goffstown, NH. 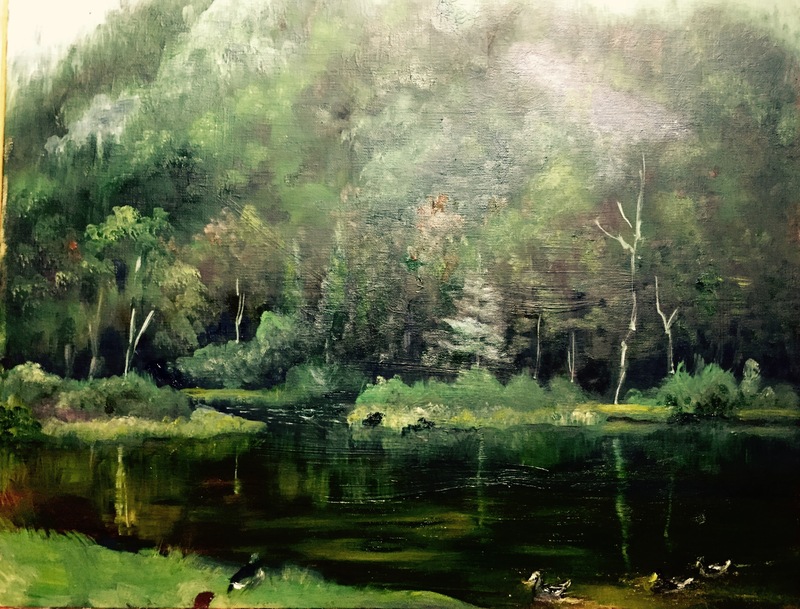 Opening this week as part of NH Open Doors is another popup from East Colony Fine Art: at Salzburg Square in Amherst, NH, Thursdays through Sundays, 11-5, from now until the day before Christmas. This Sunday, as part of the NH Open Doors, I will be painting a demo at the store. 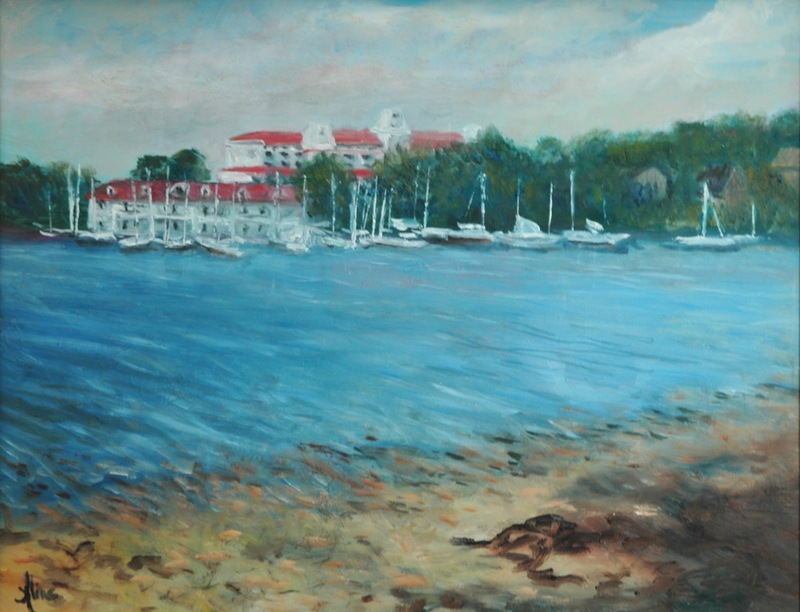 As usual, you may view paintings with prices and order prints, iPhone cases and the like at my Fine Art America page. If the painting you are interested in is not there, or if you prefer to bypass that experience, you may contact me by email to alotter@mac.com. We hit two locations last week: Wednesday at St. Gaudens National Park in Cornish, NH; and Sunday near Mt. Washington and Crawford Notch. Both times I was with Sharon Allen and Betty Brown, and on Sunday, Mary Crump and Jim O’Donnell joined us. Sunday was Day Three of the annual International Plein Air Painters (IPAP) paintout. I had to skip Days One and Two because of schedule conflicts. I think that was a good thing–I was fresh and rarin’ to go on Sunday. Augustus St. Gaudens was a sculptor. His two most famous sculptures are the Shaw Memorial, which sits outside the State House in Boston; and Diana, the largest of which lives at the top of Madison Square Garden. A small Diane graces the Currier Museum in Manchester, NH, and another large one is on display in St. Gaudens’ studio. This is the view of her that I could get from the doorway; I was not allowed inside because of my canine companion, Justice. Justice was with me as a treat for him. When I leave him at home, I have to lock him in the bathroom because nothing else seems to contain him when he gets the urge to defecate in the living room. To the list of outdoor painting problems, therefore, I have to add the possibility that your dog will scare off strangers who might want to see (maybe buy?) what I am painting. He was pretty good on Wednesday; only chose to bark at two people. 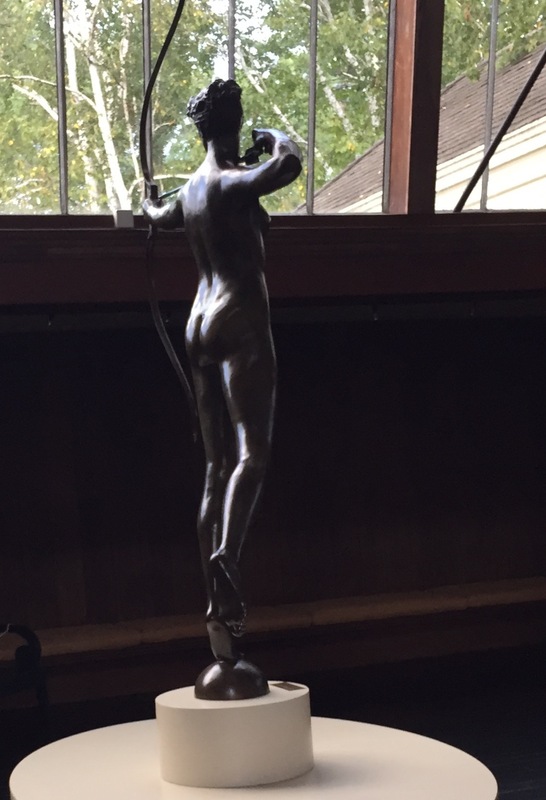 Nobody was interested in what I was doing anyway–they were there to see St. Gaudens. The statuary found in the gardens outside his home were not his pieces. However, he chose the statues to decorate his garden, so they must have enough artistic merit to justify a painting of them. 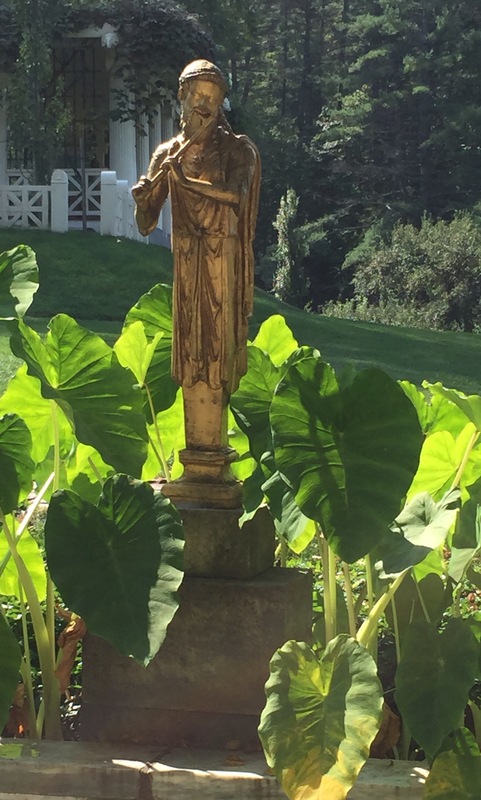 For my first painting at St. Gaudens, I followed Betty’s lead and painted a statue of Pan standing over a fountain of sorts and surrounded by plants with huge arrow-shaped leaves, similar to a house plant that I used to cultivate but whose name has slid out of reach in my memory. 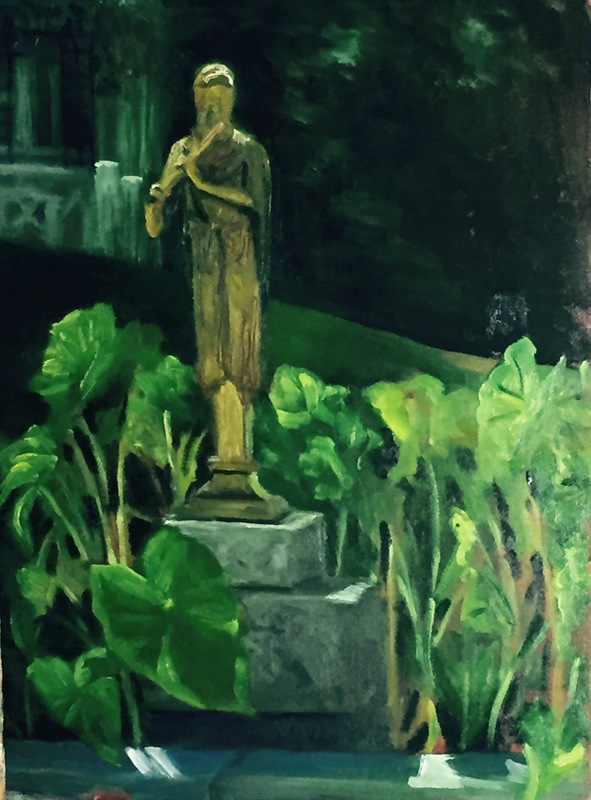 Here is my photo of the statue, followed by my painting. Mind you, the light had changed between the time I took the photo and when I got to the point of lighting my composition. Just as I got set up to paint, a rain cloud arrived and slowly passed over. I checked my iPhone, and as far as it was concerned, the sun was still shining. So I sat tight, using two sun umbrellas to shelter in place. Justice was not pleased. I suggested to him that he could get under the chair I was sitting on for pretty good protection, but no, he had to rely on my easel/palette tray. Here is what my subject looked like for about 20 minutes. 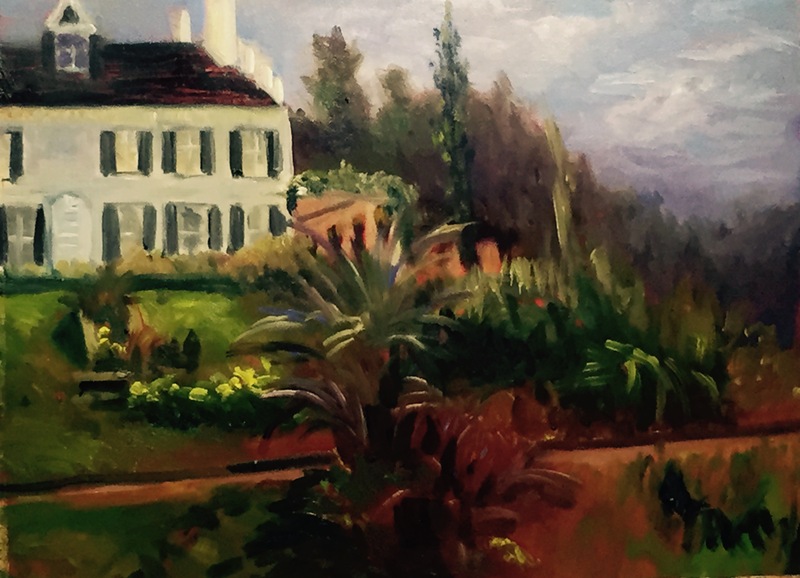 As a result of the rain shower, and perhaps also the complexity of my subject, I could not finish the painting of the house and garden. I may use photo references of the grasses later to complete the floral grouping in the foreground. Justice did not accompany me on Sunday to Crawford Notch. On Saturday, a friend took him away to Massachusetts for sleepovers, but that left the Great Dane, Honey, all alone. I lined up a few people to let her out periodically. On our way up to Franconia Notch, the weather was concerning–cloudy, drizzly. Then it perked right up as we continued north of the Notch, on past the Mt. Washington Hotel, which coincidentally was hosting a major art fundraiser for the northern forest. We had to get to the Willey House because Betty and perhaps others would be meeting us there for IPAP. The weather deteriorated. Clouds were very low, and it felt as if it might drizzle at any moment. But it didn’t! We stuck it out. My painting seems to have darkened as it dried, which is odd. If I had had sun lighting my canvas, I would have painted too dark, but I certainly had no sun that time. After having lunch at the Willey House, we headed up to the Mt. Washington Hotel. The sun was still shining on the Hotel, but the mountains were still obscured with clouds. In addition to sun, this spot had wind. Most of the artists who were there painting not for IPAP but for the fundraiser were set up on the leeward side of the wide veranda that encircles the hotel. 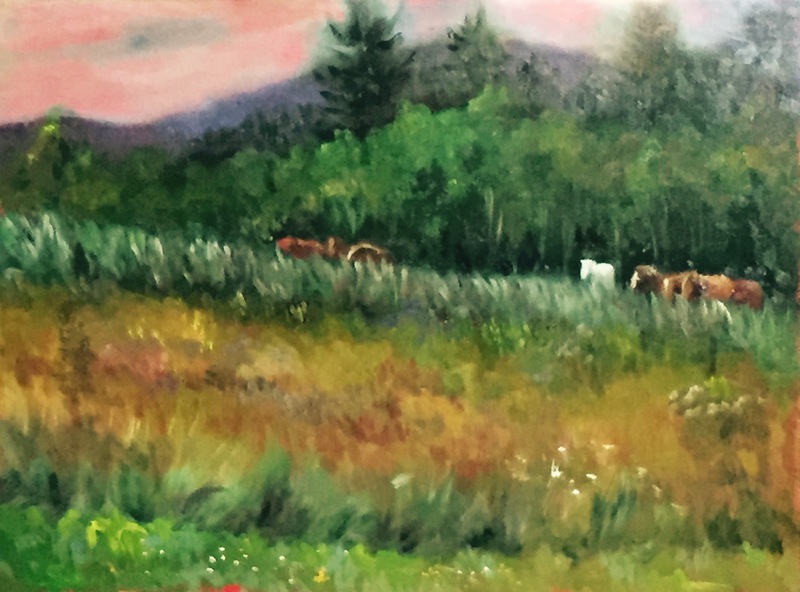 Betty and Mary joined them, while Sharon, Jim and I went in search of an angle from which to paint the horse that we had spotted as we drove into the hotel. It wasn’t easy because of the distance the horses were from the road, and the impossibility of getting any closer. That last line of defense for the horses were cattails, ergo wetlands. The closer vegetation was probably infested with ticks. Wimps we were. And when I sat to paint (which is how I have to now), my line of sight on the horses did not include any legs. Perhaps just as well. I have not painted many horses, and all I had to worry about was the body, neck and head. Legs and feet can come later. 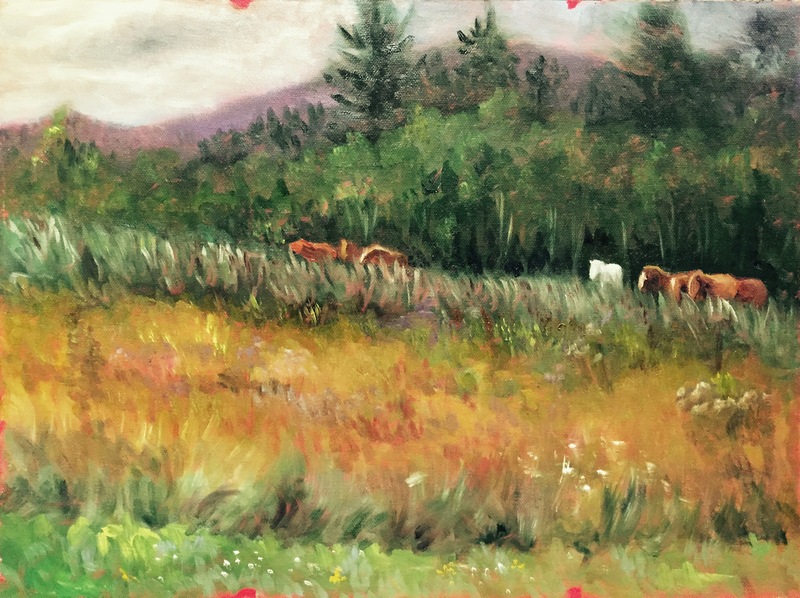 I painted the horses on a panel toned with cadmium red. You can see hints of that red here and there. The sky was the last piece I put in. I liked it with the bright red sky. I hated the whitish gray sky. So before it dried completely, I tried wiping out the whitish gray. Red appealed to me I think because it is dark, and I wanted a dark value in the sky so as to increase the attention paid to the field. It is hard to determine the value of red as juxtaposed to other colors. I supposed I could make a dark blue sky. So that is what came from two days of painting outdoors in the fresh air, sunny and cloudy and sometimes wet. 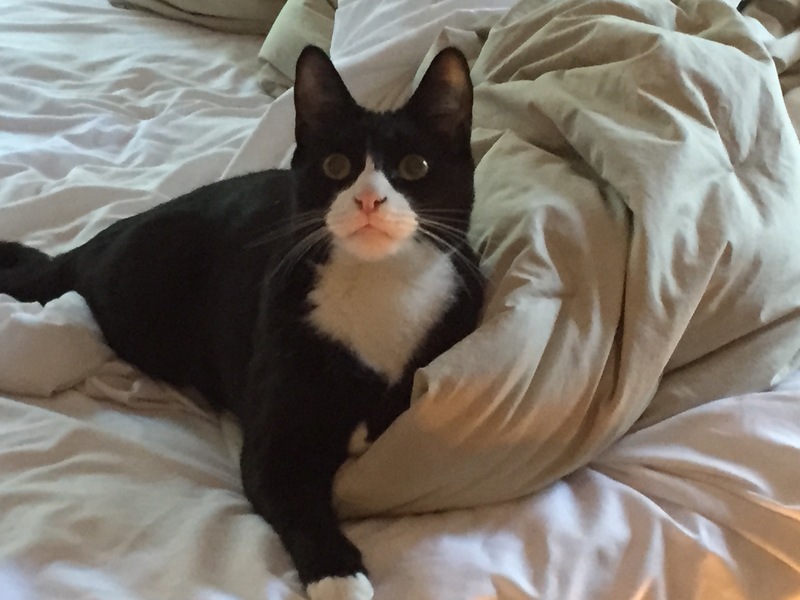 Before I close, I know that Bad Cat acquired some fans, so here is another shot of him in my bed. His real name, by the way, is Blue. Bad Cat Blue. At the Bartlett Inn in Bartlett; at the Bernerhof Inn in Glen; at the Red Jacket Inn in North Conway; and at the law offices of Mesmer and Deleault at 41 Brook St in Manchester. This location is on the side of a hill called Uncanoonuc. Actually, there are two hills by that name, next to each other, and even Wikipedia avers that they are “mountains” with impressive views of Manchester to the east, the Wapack range to the west, and on a good day, Boston to the south. From Manchester, the Uncanoonucs resemble the mounds of a woman’s breasts, and Uncanoonuc is a native American word meaning just that. One Uncanoonuc boasts a road upwards. 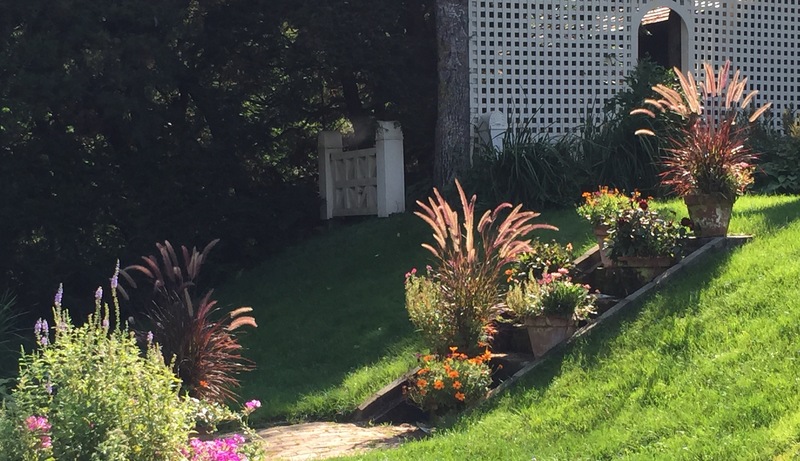 Along the way is a retail plant nursery that has installed groupings of shrubs and flowers to show its customers how lovely is a good landscaping plan. 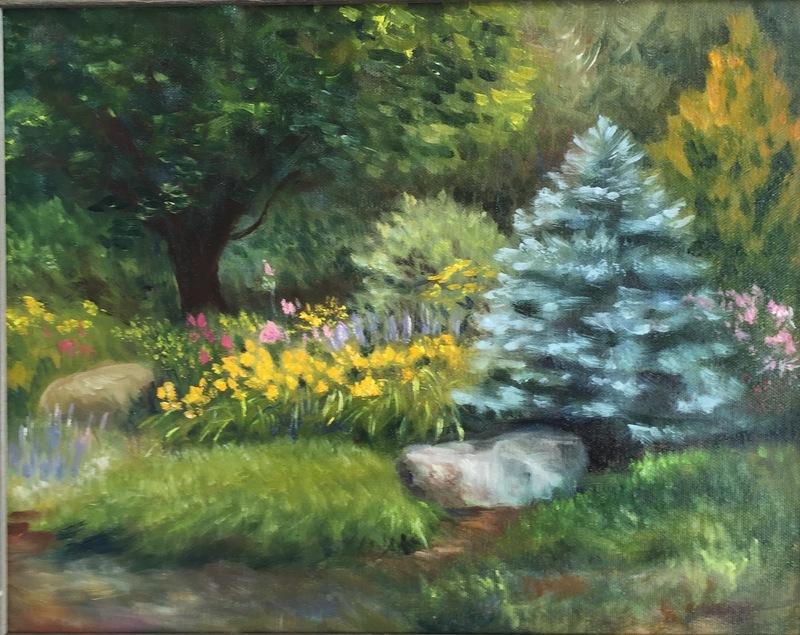 The blue spruce caught my eye, in part because much earlier in my painting career, I had recreated another Little Blue Spruce. Well, I don’t think I can say my blue spruce technique has improved at all since 2008! The earlier blue spruce was growing at the studio of the “Putney Painters”, where I was taking a workshop with Albert Handell. Albert liked my spruce but thought I had crowded it too much with the other trees. I usually take the advice of masters to heart, but maybe 20 percent of the time, I stay true to my own original intent. I see his point, but I also admire the pluckiness of the baby spruce staking its own territorial claim under less than ideal circumstances. I’ll bet today it is crowding that building in the background. 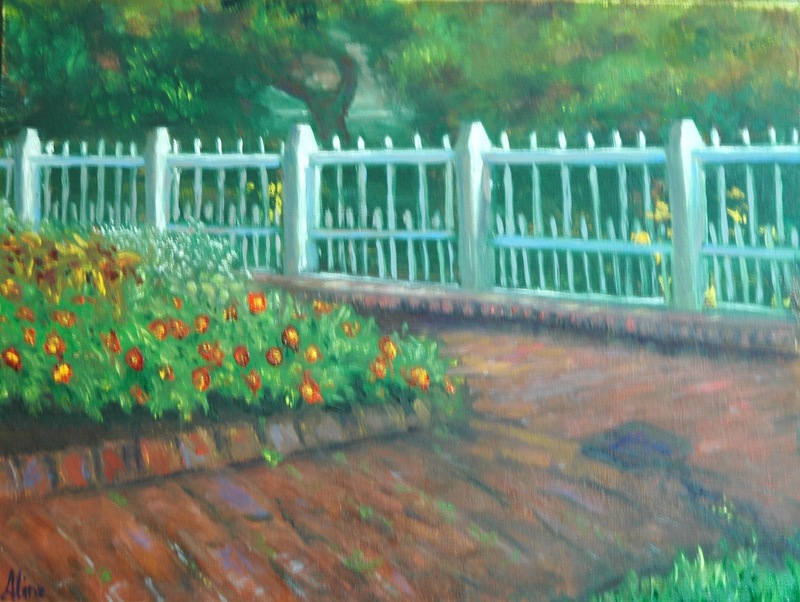 In Newport, in the course of delivering and picking up a painting for the regional show at the Library Arts Center, I got myself invited to participate in the Garden Tour, as a painter. They had about ten different gardens open for tour, each with different attributes. I told them I cared only about the flowers, not interested in mountain vistas or water features, so they sent me to the site of an abandoned gravel pit. The homeowners have been reclaiming the land patch by patch. As each load of topsoil was dumped into a pile, stuff got planted . I chose to paint the pile devoted to the memory of a beloved dog who had passed the year before. A Boy and His Dog . . . 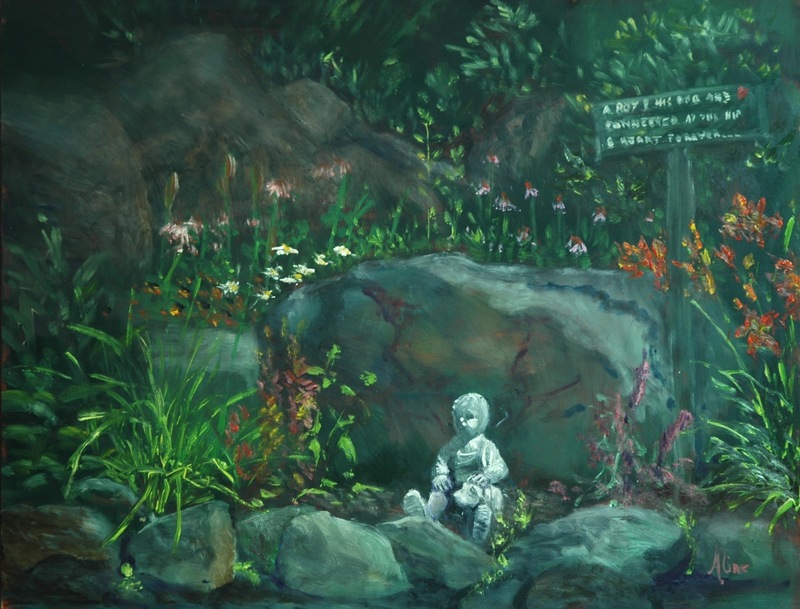 The message set forth on the rustic sign reads “A boy and his dog are joined at the hip and heart forever.” So instead of flowers, I found myself focusing on hardscape elements of rocks and sculpture, so easily is the artist’s intention waylaid. When I had finished A Boy, I made another stab at featuring flowers. I went in search of a floral closeup. I knew I was doomed to fail at the task of matching the glowing fuchsia reds of the petunias, but set out to try anyway. The next day, after the paint had set up a little, I was able to add cleaner, brighter color here and there so as to convey the sense of color, even if the exact color remained elusive. 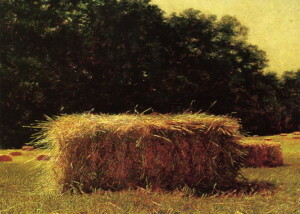 The straw strands in the basket came mostly out of my head, or rather, out of my memory of my favorite painting by Jamie Wyeth–Hay Bale. Isn’t that the most lovingly portrayed hay bale ever? A living, almost breathing, hay bale. Don’t you feel like you could stab it with a pitchfork right on your computer screen? Just imagine how it looks in person, as I saw it on the wall of the Boston Museum of Fine Arts last year. 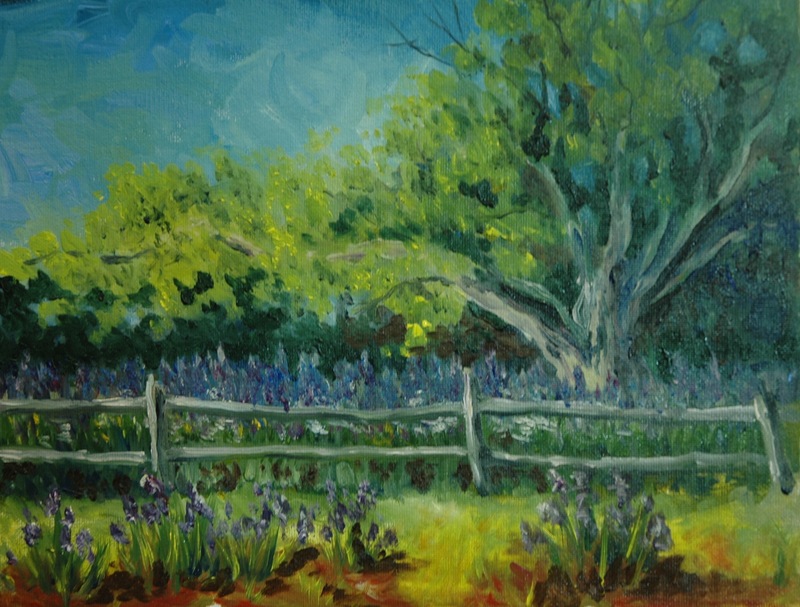 I have one more Exeter painting to show–it was painted “live” just before a lawn party at the Exeter Inn. I painted another during the lawn party, but I don’t love it so much. 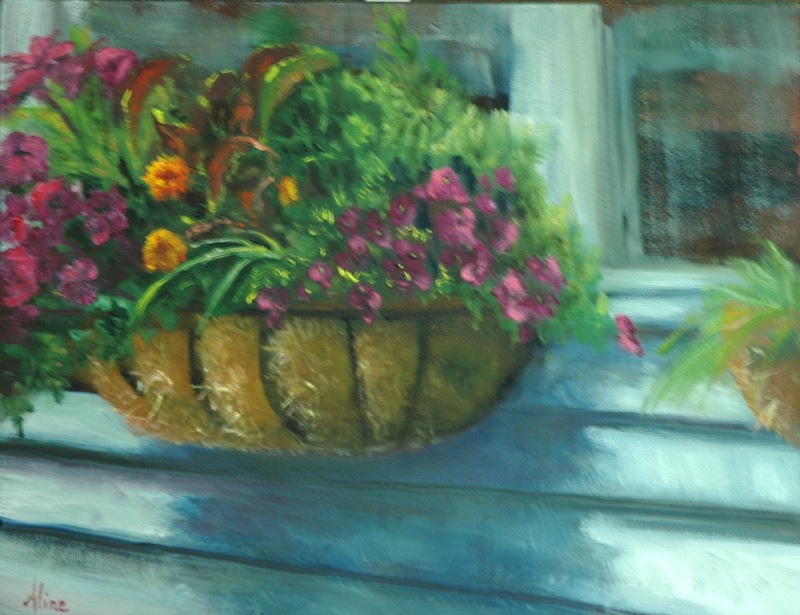 I was pleased with the flowers in this painting, and I hoped my handling of flowers in the landscape might be improving. The Zinnias are perhaps too carefully depicted. Reality is my downfall. The biggest challenge here was the shoreline–how to show the transparency of the water’s edge lapping on the rocky beach. I’m growing weary of green! Note that the landscape portion of this figure in the landscape is not much more than fuzzy suggestions of landscape. I felt it had to be thus. All in all, the lesson I have taken away from these three weeks of fairly intense painting is renewed awareness that I still suffer from a deficiency that has plagued me all along. I’m not “loose” (messy) enough. Is it that I’m so fast a painter that I end up wasting my time on “cleaning” and straightening and perfecting? For example, the windows behind the window box were never “finished” because, thank the lord, I realized I could not improve on their rough state. But examples of overpainting are too abundant. When will I ever learn? with the East Colony artists for the rest of July at 163 (167) Water Street, Exeter, NH; at the Bartlett Inn in Bartlett; at the Bernerhof Inn in Glen; at the Red Jacket Inn in North Conway; at the Firefly American Bistro on 22 Concord Street, Manchester (reception August 3); and at the law offices of Mesmer and Deleault at 41 Brook St in Manchester. Also, on July 23, from 5 to 8 p.m., the doors to all art galleries in Manchester are open and served by a old-time trolley. I am participating as a member of the Manchester Artists Association in a one-day exhibit at the Rines Center, on the Trolley route. It’s all free! See the Open Doors Trolley Night website for more information and a list of venues that have a show going on that night. 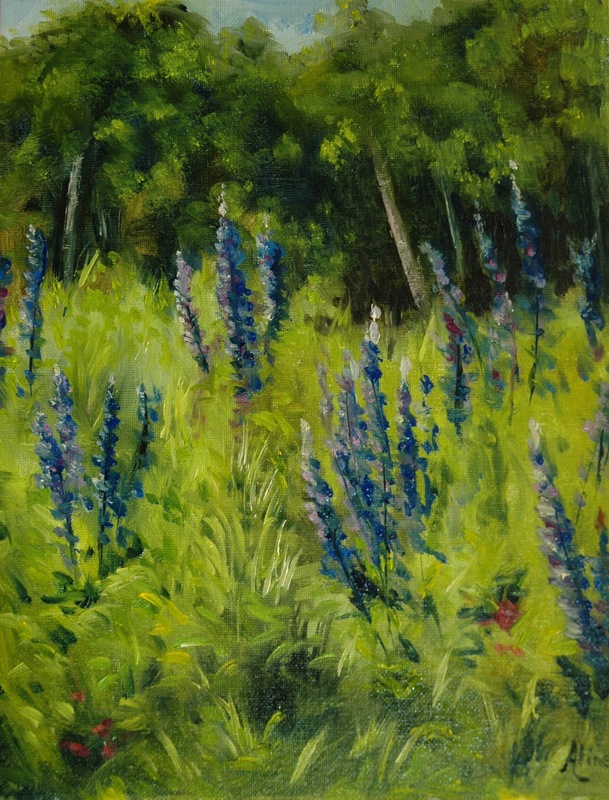 Every year in June, our NH Plein Air group organizes an outing to Lupine country. 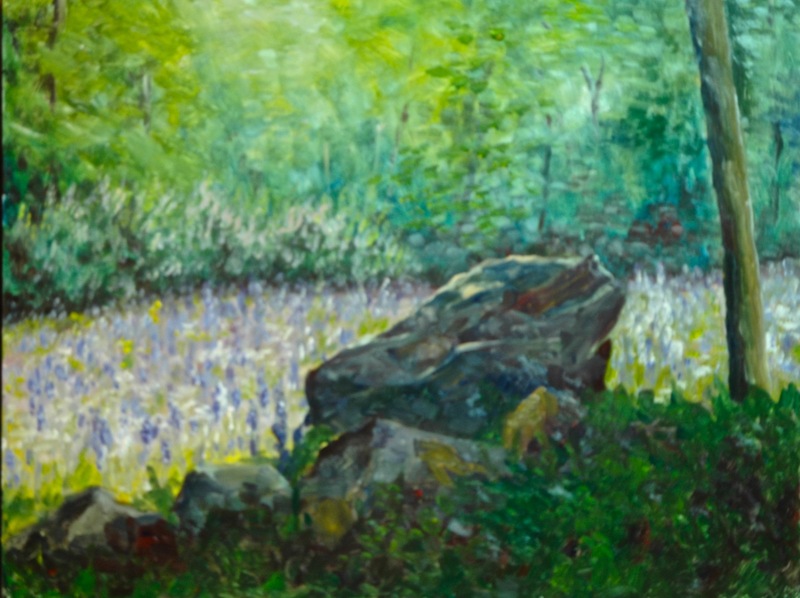 “Lupine country” in NH means primarily Sugar Hill, because Sugar Hill encourages the propagation of lupines in support of its annual Lupine Festival. Sugar Hill is a drive of about two hours from Manchester, where I am. But great lupine patches do exist elsewhere. You might therefore think we are a little mad to drive for two hours to find paintable lupines when we could find a closer patch, or even create our own patch at home, given proper conditions. But we plein air painters are a travelin’ sort, and we would hike into the wilderness for miles when younger and just as mad. For an example of such a mad artist/hiker/camper, see this blog. My companion on this year’s lupine hunt was Flo Parlangeli. As if a two-hour drive wasn’t long enough, the adventurous spirit in which we set out Wednesday morning motivated us to take a detour around the Pemigewasset Wilderness, through Crawford Notch, where we had heard of a glorious lupine patch in years gone past. Alas, tales of its demise had not been exaggerated, but enough remained to justify a quick painting from each of us. 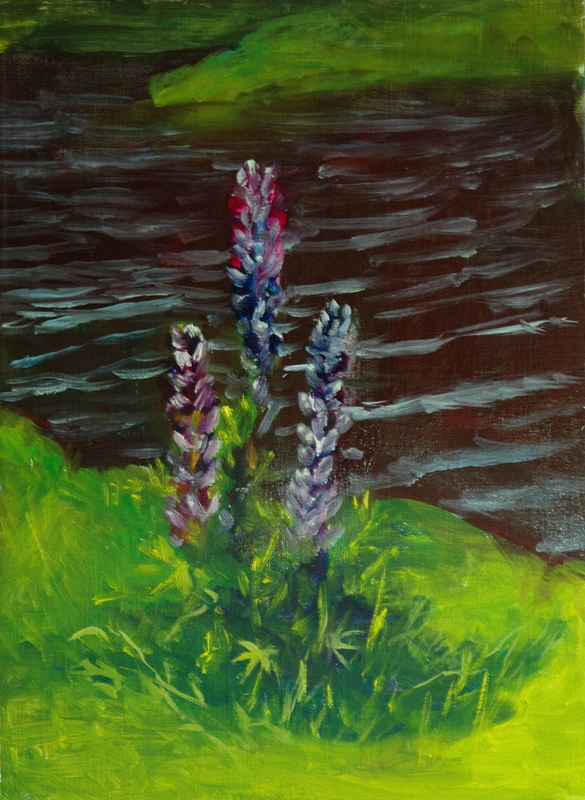 I have never been satisfied with the color of my lupines in paint, but got a clue from Michael Chesley Johnson in his recent blog on painting lupines in New Brunswick: when the blue of the flowers is applied to a surface of wet paint, the blue sinks into the paint underneath, muddying the blue; so the painter must go back after the oil paint has set up a little bit, with fresh blues to represent the glorious blue of the real life flowers. This I did, and I also blended in a tiny portion of a rose color that I don’t take outdoors with me, to achieve the purply blue lupines. Unfortunately, the image that I used to illustrate the above statement does not now seem to me to be effective in that regard. I must say that the photographs that I took of my own two paintings in my studio do not truly convey the lightness, the sunlightness, that exists in the originals. But what else is new! The only times I have seen photos that looked as good as the paintings is after they have been converted into giclee prints of the painting. So what have I learned as a result of the lupine hunt and the writing of this blog? 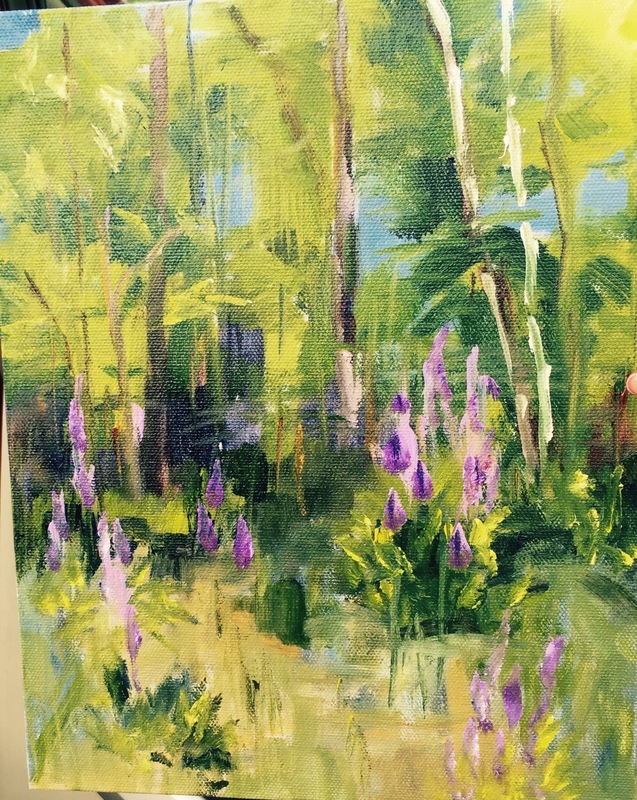 Impressions of lupines work better than portraits of lupines. Flo’s color sense is so amazing–notice how it led her to emphasize the deep purple of the flowers and the yellow tint in the gnarly tree. I must work harder on not being literal. Flo would say that hers are not finished paintings. She intends to work them up in her studio, I think. I considered making improvements to my two but decided against it. Not that they are perfect, but they are what they are–an impression of a string of moments in a delightful spot on a delightful day in June. with the East Colony artists for the rest of June at 163 (167) Water Street, Exeter, NH; at the Bedford Public Library; at the Bartlett Inn in Bartlett; at the Bernerhof Inn in Glen; at the Red Jacket Inn in North Conway; at the NH Institute of Art, 77 Amherst St., Manchester; and at the law offices of Mesmer and Deleault at 41 Brook St in Manchester. This floral is the second of three projects that will eventually emanate from the Floral Painting course I am taking at the NH Institute of Art with Deirdre Riley. I missed three classes because of the Florida sojourn, but I needed only the two weeks remaining to me for this painting. Two weeks equals six hours of painting. I could actually paint a living floral arrangement and get it done before the flowers started to wilt. But I’m not that energized anymore. My batteries only last three hours. Coincidentally, the annual Petals to Paint event comes this week–TOMORROW actually, to East Colony Fine Art. About 20 floral designers are designing and putting together a (live) flower-based sculpture inspired by the painting that each chose a month ago. One of the designers chose my “Nap, Interrupted” (the very large cat portrait) as her inspiration. If I had a six-hour battery, I’d be able to go in after hours at the Gallery and make a painting of her creation. 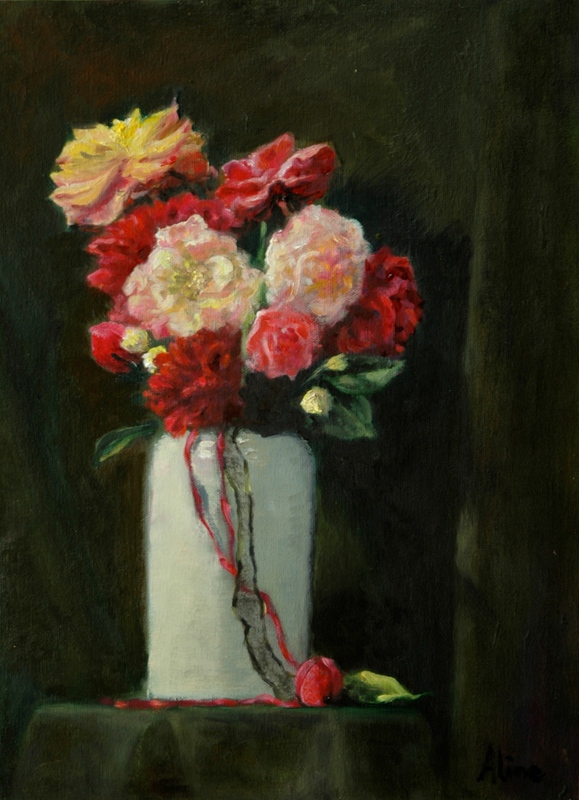 The reception for Petals to Paint is Thursday from 5 to 8 p.m., but the exhibit will remain up for the next two days. The address is 55 South Commercial Street in Manchester, NH. I’m very sorry to report that this will be the last P2P at this location, and one of the last receptions for East Colony at this location. We decided not to renew our lease because not enough of our artists were willing to commit to the continuance of the Gallery. On May 14, we will host our last reception, a kind of farewell party. Our last day will be May 30. The portraits that I have been wrestling with are mostly of Margaret, although I have to confess my last portrait of Aubrey was no keeper either. 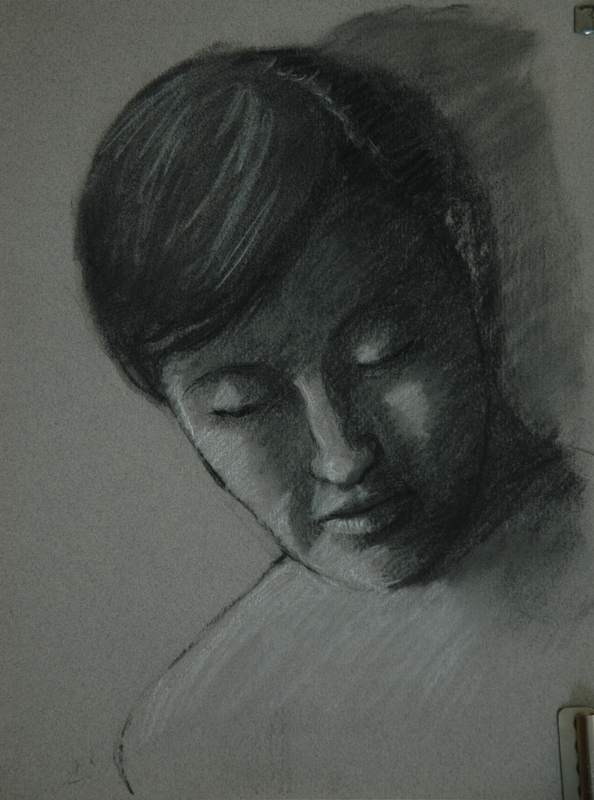 I was trying so very hard to get a likeness of Margaret in two 3-hour sessions, that I lost my perspective over the works as entire pieces. I was going to post pictures of these failures but I lost my nerve. Just trust me–you don’t need to see them. Of course, my response has been to try harder. At SLG (Saturday Life Group) we had a new model, a very young tall lanky guy named Andrew. 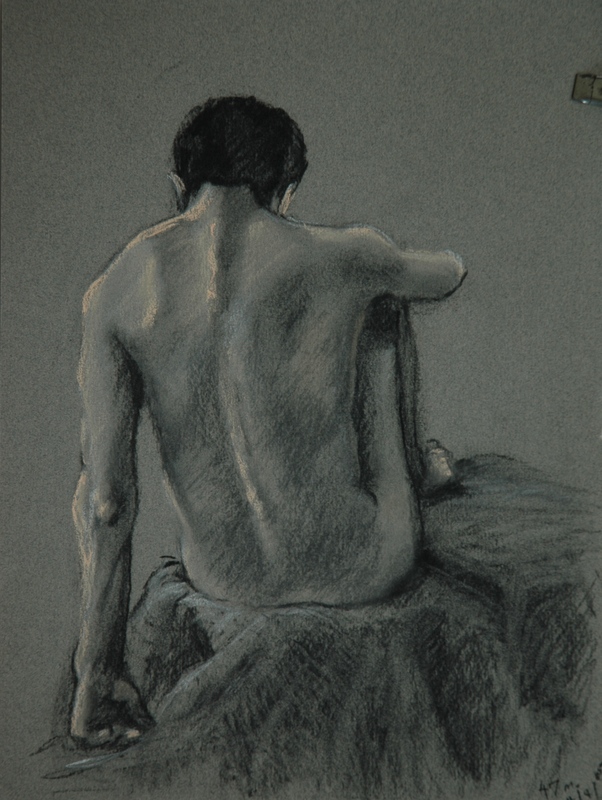 I had wanted to concentrate on portraiture, but all I got was the back of his head for the first long pose (“long” in this group means 45-50 minutes). The last pose gave me the opportunity I sought. The problem with this “portrait” is that it is largely invented. He held his head in this position for perhaps five minutes, then it started dropping, dropping, until finally his chin was on his chest. I continued with my original version, filling in what I already knew about faces, treating it as some kind of memory exercise. at the East Colony Fine Art Gallery in Manchester (Langer Place, 55 S. Commercial St., Manchester, NH); at the Bartlett Inn in Bartlett; at the Bernerhof Inn in Glen; at the Red Jacket Inn in North Conway; and at the law offices of Mesmer and Deleault at 41 Brook St in Manchester.